This pattern was born from my fevered imagination when I was on the "good drugs" after a recent surgery. I waited until I was off the drugs to write the pattern. This is a perfect way to try out sock knitting for the first time. You only have to make one and it's smaller than a regular adult sock so it shouldn't be too painful. All the elements of a real sock are here so you may get the courage to try a pair after you've made the hat. 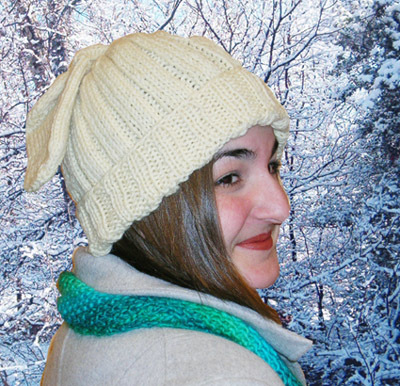 Note: Hat is worked in the round on two circular needles. 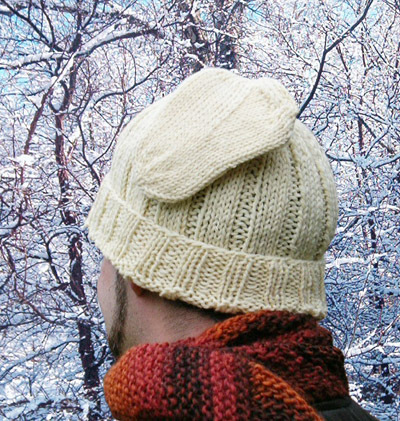 If you prefer, it can be worked using double-point needles, or with one circular needle, using the "magic loop" technique. All slipped sts are slipped purlwise. Round 1: [K4, p2] to end. Turn your work around to begin working back in the other direction. Using smaller needles, CO 60 sts. Distribute sts evenly between needles and join to begin working in the round, being careful not to twist. Work 10 rounds in 2x2 Rib. Next Round: Using larger needles, [k4, m1] 18 times, k8. 78 sts. Next Round: Using larger needles, [(k2, m1) twice, (k4, m1) nine times] twice. 102 sts. Work in 4x2 Rib until work measures 6.25[7.75] inches. Round 1: [K1, k2tog, k1, p2] around. 65 sts. Rounds 2 & 3: [K3, p2] around. Round 4: [K2tog, k1, p2] around. 52 sts. Rounds 5 & 6: [K2, p2] around. Round 7: [K2tog, p2tog] around. 26 sts. Next Round: Using smaller needles, [k1, p1] around. Work 8 more rounds in rib as set. Next Round: [Work 11 sts in patt, k2tog] twice. 24 sts. Next Round: [Work 17 sts in patt, m1] twice. 36 sts. Arrange your sts so that you have 2 needles with 12 sts each. Heel flap will be worked back and forth over 12 sts on first needle only. Repeat these 2 rows 4 times more. 10 rows of Heel Flap have been worked. Row 1 [RS]: Sl 1, k6, ssk, k1, turn. Row 2 [WS]: Sl 1, p3, p2tog, p1, turn. Row 3 [RS]: Sl 1, k4, ssk, k1. Row 4 [WS]: Sl 1, p5, p2tog, p1. 8 sts rem. Row 1 [RS]: Sl 1, k10, ssk, k1, turn. Row 2 [WS]: Sl 1, p5, p2tog, p1, turn. Row 3 [RS]: Sl 1, k6, ssk, k1, turn. Row 4 [WS]: Sl 1, p7, p2tog, p1, turn. Row 5 [RS]: Sl 1, k8, ssk, k1. Row 6 [WS]: Sl 1, p9, p2tog, p1. 12 sts rem. K all sts on working needle (Needle 1), then with same needle pick up and 7 sts along edge of heel flap, and one st between heel flap and held sts; using second needle (Needle 2), k held sts, then pick up and k 1 st between held sts and heel flap, then 7 sts along edge of heel flap. 16 sts on Needle 1, 20 sts on Needle 2. Next Round: K all sts on Needle 1, k first 12 sts of Needle 2, slip rem sts from Needle 2 to Needle 1. 24 sts on Needle 1, 12 sts on Needle 2. Repeat these 2 rounds 5 times more. 24 sts rem; 12 sts on each needle. Round 1: [K2, k2tog] around. 18 sts. Round 3: [K1, k2tog] around. 12 sts. Break yarn. Thread yarn on tapestry needle, draw through sts and pull tight. Weave yarn though all sts once more. Fold up brim to wear. Carla lives just outside Pittsburgh, PA, USA. Her main passion is knitting but she enjoys bead work, too. 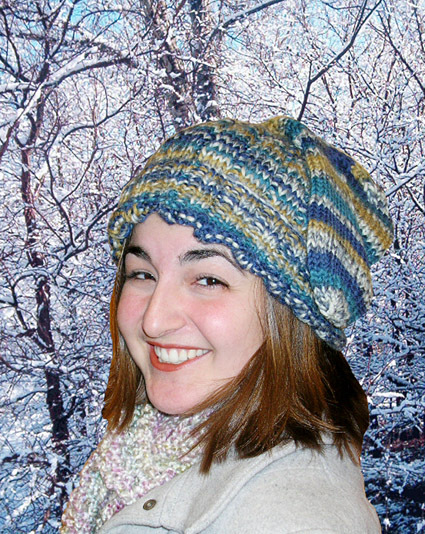 She's only been knitting for about 2 years but has a long history with crochet. 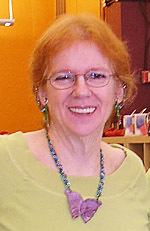 She has had some of her original crochet afghan designs published by a major publisher. Carla always have several projects on the go at the same time and says there's a fine line between what gets finished and what goes to the frog pond.